Born 26 Jan 1847 Perry, Marion County, Indiana, U.S.A.
1723 West Capitol Ave - death certificate and widow's pension application. Buried 12 Sep 1916 Crown Hill Cemetery, (Military Section 9 Lot 1401, marker), Indianapolis, Marion County, Indiana, U.S.A.
"Information Located from Crown Hill Records: Robert Thomas b. 26 Jan 1837 Indiana; d. 12 Sep 1916 age 69, cause of death Hodgekins Disease; Interment 14 Sep 1916 W.E. Krieger Funeral Home; Section 9 Military Grave # 1401; Private, Company A, 132nd Indiana Infantry"
U.S. Census Perry, Marion County, IN 1850, 1860, 1870: living with parents. Indianapolis, IN Directories, 1887-1890, year 1890: "Robert Thomas, 161 1/2 Massachusetts Avenue, sawyer"
"Appeal from J.P. Court. #19640 George Kessler vs. Robert Thomas, Superior Court, Room 1." "HORSES, VEHICLES, ETC. Geo. Kessler, Prince of Auctioneers, will sell at public auction every day this week the following for cash: fifty horses, mares, mules, ponies, carts, pony buggies, wagons of all kinds and harness of all descriptions. . . . George Kessler has made this a lifetime business and buys at the best prices and in big quantities. He is therefore able to show you bargains in most everything you should desire. Sale opens every morning at 9:00 sharp. 426 West Pearl Street." Evidently auctioneer George Kessler sued Robert Thomas, lost in Justice of Peace Court, and appealed to Superior Court. Roy Elmer Thomas told me that his father, Robert Thomas, engaged in buying and selling horses and sometimes "pumped them up" to make them look better, hence more valuable. This lawsuit may have resulted from such a transaction. "25 Jul 1870, E. Ball & Co. v. Robert Thomas, William Thomas, et al, Defendants." [Wikipedia: "The Ball brothers (Lucius, William, Edmund, Frank, and George) were five American industrialists and philanthropists, who established a manufacturing business in New York and Indiana in the 1880s . . ." They made glass jars for home canning of fruits, vegetables, etc. "17 Oct 1879, Edward Thomas & Robert Thomas, Petitioners, William T. Thames, et al, Petitioners, Civil Case-Partition of Property. "Superior Court, Room 1. #99039 Robert Thomas vs. Indiana Union Traction Company. Damages. McDonald & White." Roy Elmer Thomas told me that his father, Robert Thomas, had a contract with the city of Indianapolis IN to water the streets, so as to settle the dust. This lawsuit may have followed a collision with a street car. Indiana State Library Genealogy Database, Marriages through 1850: "Edwin [sic] Thomas & Catherine Moore, m. 30 Aug 1838 Marion County." LDS FamilySearch, Indiana Marriages, 1780-1992: "Catherine Moore & Edmond [sic] Thomas, m. 30 Aug 1838 Marion County." "17 Oct 1879, Edward Thomas, Petitioner & William T. Thames, et al, Petitioners, Civil Case-Partition of Property." Married 24 Nov 1875 Marion County, Indiana, U.S.A.
Indiana Marriage Collection, 1800-1941: "Robert Thomas, age 13 [sic, 18] & Sadie E. Wilkins, age 13 b. Abt. 1862 [sic, 15], m. 24 Nov 1875, Marion County, IN." Indiana Marriage Collection, 1800-1941: "Addie Davenport, age 16 b. Abt. 1863 & Albert [Robert] Thomas, m. 15 May 1879 Marion County." LDS FamilySearch Indiana Marriages, 1780-1992: "Robert Thomas & Adie Davenport, m. 15 May 1879 Indianapolis, Marion County." 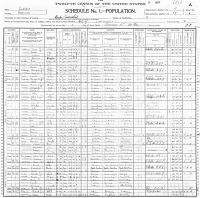 This update in 1915 included a list of his living children and their birthdates. The "Robert Thomas Pension Letter dated 5/8/09" was indeed signed by Robert Thomas, but the body of the letter was evidently written by his wife, Addie Davenport. Compare the script of the word "Thomas" in the "I Robert Thomas" at the beginning of the "Pension Letter" with the script of "Thomas" in the signature of Addie Thomas near the top of page two of her pension application. The body of Addie Davenport's pension application was written by a clerk, probably in her lawyer's office. Born - 26 Jan 1847 - Perry, Marion County, Indiana, U.S.A.
Married - 24 Nov 1875 - Marion County, Indiana, U.S.A. Buried - 12 Sep 1916 - Crown Hill Cemetery, (Military Section 9 Lot 1401, marker), Indianapolis, Marion County, Indiana, U.S.A. This is the only known photo, taken about 1910-15 in Indianapolis, IN. Robert Thomas (1847-1916) had a contract with the city of Indianapolis, Marion, IN to sprinkle the streets to settle the dust. His rig may have looked like the one in this photo. Roy Richard Thomas recalled that his father, Roy Elmer Thomas, said members of the Thomas family sometimes slept during hot summer nights in a canoe under a bridge that spanned the White River. About 1932, he pointed out the family's former home, a wooden frame house near the river and the bridge. The bridge in the photo looks like that bridge. MILITARY SERVICE 1864: Robert Thomas (1847-1916) enrolled May 1864 Union Army for 100 days, discharged Sep 1864, served in Co. A, 132d Infantry Indiana Volunteers, under Col. John Tarkington, father of author Booth Tarkington (1869-1946). Roy Elmer Thomas recalled speaking occasionally after 1910 to the then famous author, Booth Tarkington, on the street in Indianapolis IN. National Park Service, Civil War Soldiers & Sailors: "UNION INDIANA VOLUNTEERS: 132nd Regiment, Indiana Infantry (100 days, 1864). Organized at Indianapolis, Ind., and mustered in May 18, 1864. Ordered to Tennessee May 18, and assigned to duty as Railroad Guard in Tennessee and Alabama, Dept. of the Cumberland, till September. Duty at Stevenson, Ala., till July, and at Nashville, Tenn., till September. Mustered out September 7, 1864. Lost during service 12 by disease." Authenticated Copy of Marriage Record, license and certificate; contains no middle names or initials for the bride and groom. The Indianapolis, IN "Journal, 24 Nov 1901, p. 6. Robert Thomas had a city street sprinkling contract, Indianapolis, IN, according to his son, Roy Elmer Thomas. 1909: Robert Thomas, request for Civil War Pension increase, written 8 May 1909 probably by wife Addie, but signed by Robert. This death certificate is important because it provides the names and nativity of the parents of Robert Thomas. The occupation of Robert Thomas was "contractor." 1916: died of Hodgkins disease. 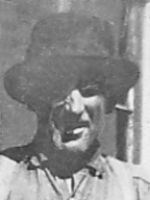 "Robert Thomas, age 33 b. Abt. 1847 Indiana parents b. Indiana, hack man, wife Addie, age 20 b. Abt. 1860 Indiana parents b. Indiana; one child b. Indiana: Maggie, one month-Apr [sic]." "Robert Thomas, age 53 b. Jan 1947 Indiana, father b. Kentucky mother b. Indiana, contractor, wife Addie, age 38 b. Jun 1861 Indiana, father b. England mother b. Kentucky; six children b. Indiana: Savilla 17, Annie 15, Mamie 13, Ora 11, Sanford, 5, Roy 1." "Robert Thomas, age 63 b. Abt. 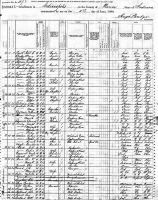 1847 Indiana parents b. Indiana, contractor, wife Addie, age 50 b. Indiana, parents b. Kentucky; six children & one grandson b. Indiana: Savilla Burks 27 waitress-restaurant & her son, Harold Burks 8, Orie 21 laborer-foundry, Anna 24 stenographer-paper company, Sanford 16 driver-ice cream company, Roy 12, Robert 8."